I have a 2008 Glastron GT205 open Bow runabout. The boat is 21ft, yellow with a matching trailer w/spare tire. Engine has 22 hrs on it with the 20 hr maintenance just completed. 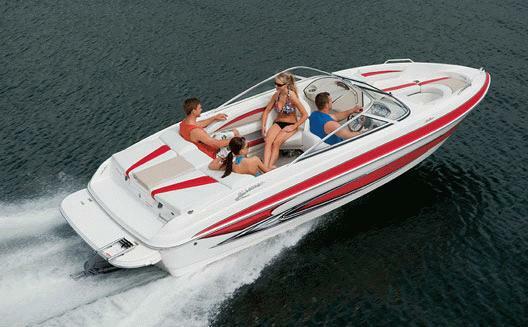 The engine is a 5.0L Mercruiser 260 inboard/outboard. Yellow bimini top. Trailer is dual axle with folding tounge and gravity assisted brakes. Stereo with CD and Aux jack. This boat is like new. We bought it new and are not using it like we thought, so we want to sell it. We have had it up to 60 mph. Gorgeous boat, stored with cover and under roof (storage facility). Used for towing tubes and a swimming platform. Can easily pull three tubers. Boat for sale has the •XL Package: tilt steering, full side glass wings, convenience package, flip-up bucket seat (1), snap-in carpet, forward pull-up bow cleat, stainless steel rubrail insert, stainless steel drink holders, stainless steel speaker covers, stainless steel thru-hull fittings, stainless steel intake/exhaust vents, stainless steel horn grill, stainless steel grab handles.